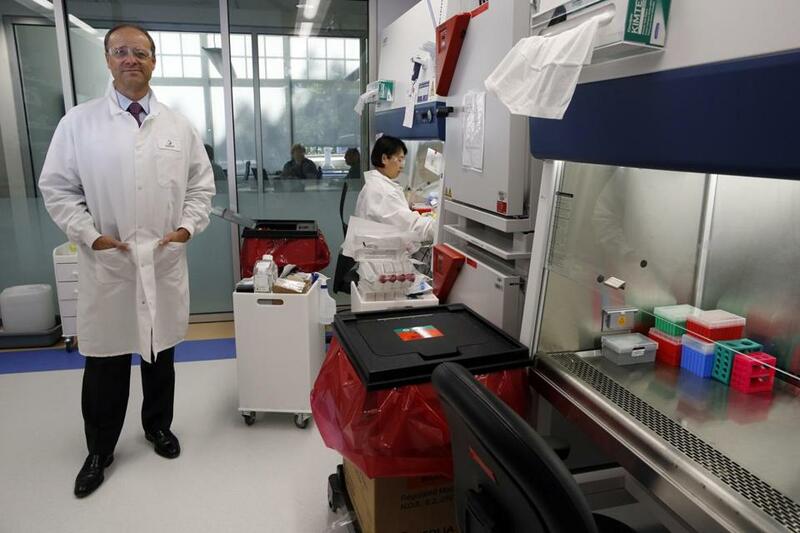 Sanofi chief executive Chris Viehbacher (left ) visited the firm’s lab in Cambridge, where research associate Lan Jiang was working on Wednesday. CAMBRIDGE — Two and a half years after buying local biotech Genzyme Corp. for $20.1 billion, Sanofi SA’s chief executive said Wednesday that the deal has paid off handsomely for his company, sparking a business surge that has added $40 billion to the international pharmaceutical giant’s market value. Christopher A. Viehbacher, in town for Thursday’s opening of Sanofi’s global cancer research center at 640 Memorial Drive, said the Genzyme acquisition proved to be a “crystallizing moment” for the French drug maker. Genzyme has been among the fastest growing parts of Sanofi, with sales increasing 25.5 percent in the first half of 2013. Genzyme’s experimental multiple sclerosis drug Lemtrada — a focal point of negotiations that followed Sanofi’s takeover bid in 2010 — won approval from European regulators Tuesday and is awaiting an OK from Food and Drug Administration by the end of the year. FDA approval of Lemtrada for US sale before 2014 would trigger the first of several potential milestone payments to former Genzyme shareholders under the original purchase deal. If the payouts hit the high end of a specified range, based on the MS drug’s eventual sales, Viehbacher has promised to buy former Genzyme chief executive Henri Termeer a bottle of French wine. “The way Lemtrada’s developing, it may cost me a very good bottle of wine,” he said. At a scheduled Thursday morning ribbon-cutting ceremony for Sanofi’s research center, which Governor Deval Patrick and other Massachusetts officials were expected to attend, Viehbacher and senior Sanofi executives plan to highlight the company’s commitment to the state and science. Among other things, they will disclose a $1 million gift Sanofi and Genzyme are making to support a program for classroom education and other science-related activities at the University of Massachusetts Boston’s College of Science and Mathematics. UMass Boston Chancellor J. Keith Motley said the gift is part of a shared vision for improving student skills in science, technology, engineering, and mathematics, and for boosting diversity in the research and science ranks of Boston area companies. Sanofi chief Chris Viehbacher, with Dimitri Wiederschain (left), met Chaomei Shi and Tim Wagenaar (right) in Cambridge, where about 230 researchers are expected to work. Sanofi will employ about 230 scientists and research workers at 640 Memorial Drive, most relocating from other company labs in the area. In a refurbished industrial building that once housed Polaroid Corp. and Ford Motor Co., Sanofi research teams will dive into cancer biology, biochemistry and bioanalytics, chemical genetics and proteomics, and pharmacology. Overall, the Paris-based company now employs more than 5,000 people in Massachusetts, about the same as it did when the Genzyme acquisition was completed in 2011. But while it has shed corporate jobs, it has added research, development, and manufacturing jobs, including some researchers transferred here from a research center Sanofi closed in New Jersey. Viehbacher, however, said the company’s future research growth is less likely to come internally than through the collaborations Sanofi is striking with smaller Cambridge biotechs, such as Merrimack Pharmaceuticals Inc. and Alnylam Pharmaceuticals Inc., and with Boston teaching hospitals, such as Dana-Farber Cancer Institute and Joslin Diabetes Center.